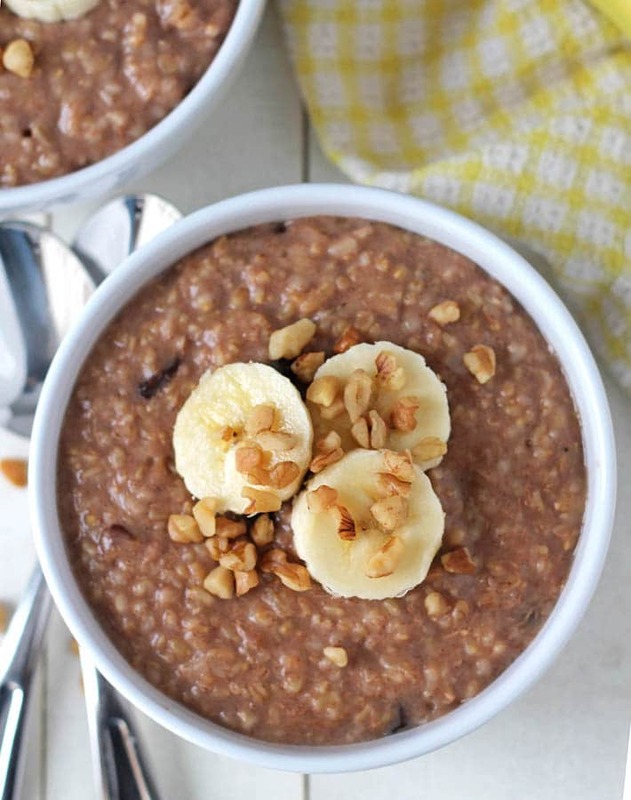 An easy and delicious recipe for banana steel cut oats (it tastes like banana bread!) 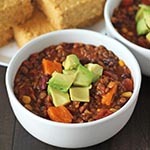 that can be made either in your Instant Pot / pressure cooker or on the stove top. 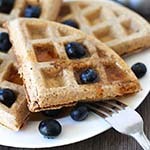 This is a vegan and gluten-free breakfast everyone will look forward to! A breakfast that tastes like freshly-baked banana bread? It’s true, and I think that’s a very good way to start the day, don’t you? With just a few ingredients, you can make this warm, filling breakfast that’s filled with flavour but is naturally sweetened and contains no oil! 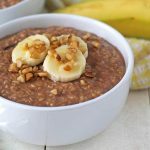 For this Instant Pot steel cut oats recipe, I went back to my pumpkin steel cut oats and my apple spice Instant Pot steel cut oats recipes, made a few tweaks, and came up with this comforting breakfast idea that will have you wanting to stock up on steel cut oats and bananas…it’s THAT good! 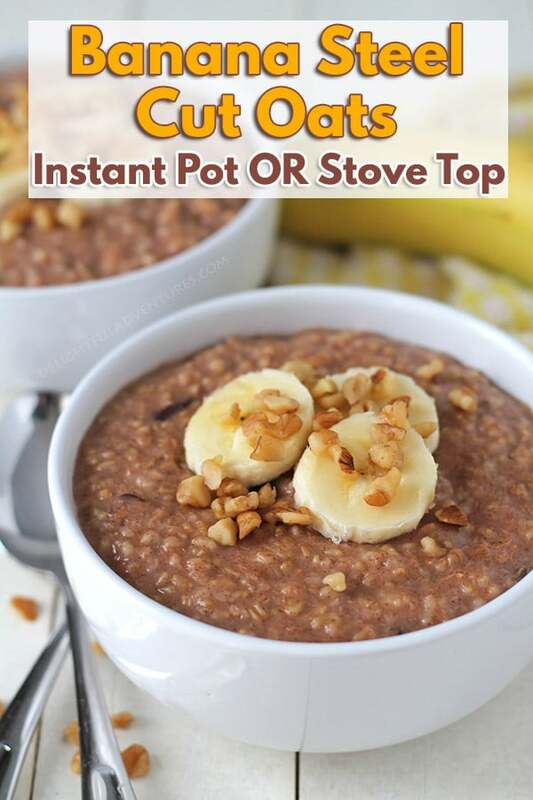 So first, before we talk more about this banana steel cut oats recipe, let’s discuss the amazing Instant Pot (<- Amazon link) pressure cooker. The one above is the one I own, it’s the 9-in-1 6-quart and I have had it for over a year now. It has become an essential part of my kitchen and I can’t imagine not having it since I prepare SO many meals in it (many of which you can find in this post all about Instant Pot Vegan Recipes!). I make soups, stews, pasta dishes, desserts, and of course Instant Pot steel cut oats in it. If you’re new to the Instant pot and you’re looking for some recipes to try, start out with this list of Instant Pot vegan recipes that I put together a while back. I’ve got you covered if you don’t have one yet by including directions on how to make your banana steel cut oats recipe on the stove. If you’re making this recipe in the Instant Pot, from beginning to end, it will take you roughly 45 minutes. That time includes the time it takes for the pressure cooker to come up to pressure and come down from pressure. Actual cooking time is only 10 minutes. 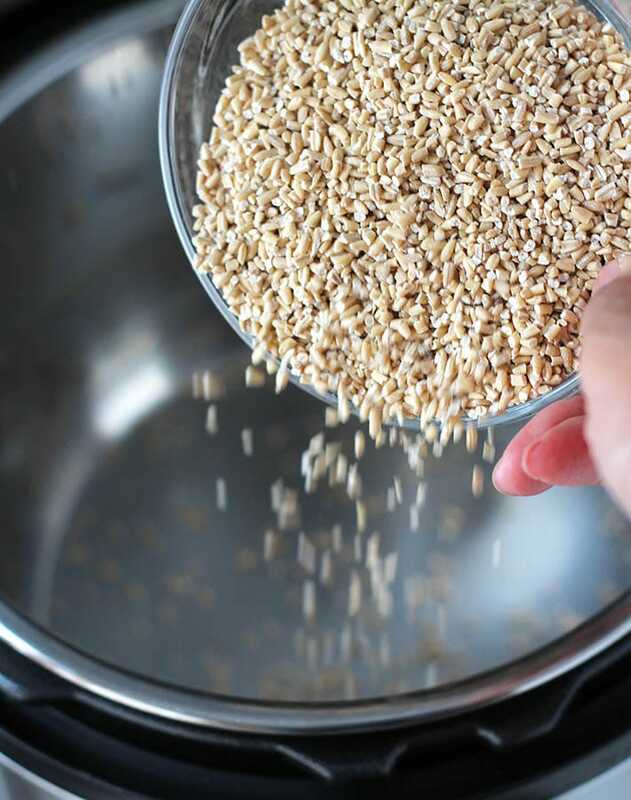 If you make your vegan steel cut oats on the stove top, it will take you roughly the same amount of time, from beginning to end, but you will have to check on it occasionally to be sure everything is progressing nicely. Both methods will give you the same end result, so whichever way you go, you’re going to end up with the same delicious bowl of banana bread steel cut oats. 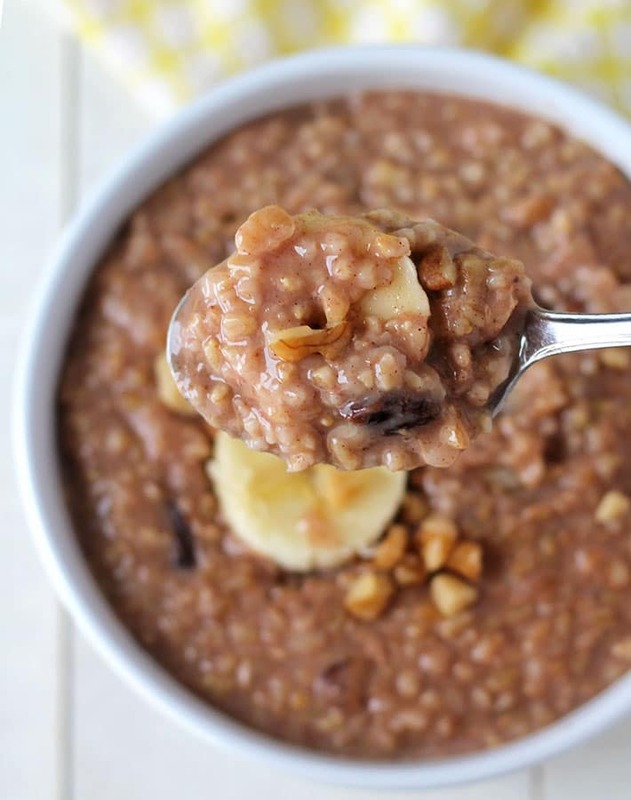 Easy, delicious, and warm banana steel cut oats that taste like banana bread! 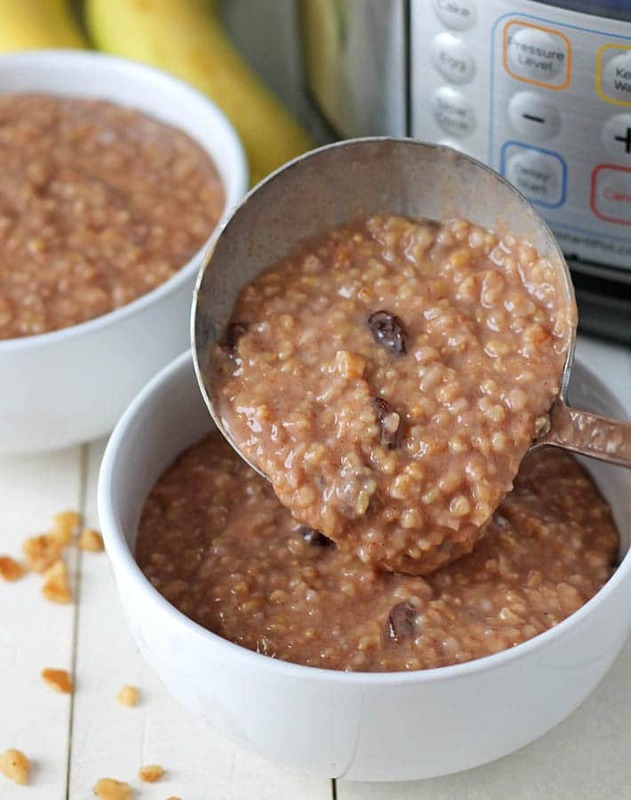 This Instant Pot steel cut oats recipe can be made in your Instant Pot pressure cooker or on the stove top. 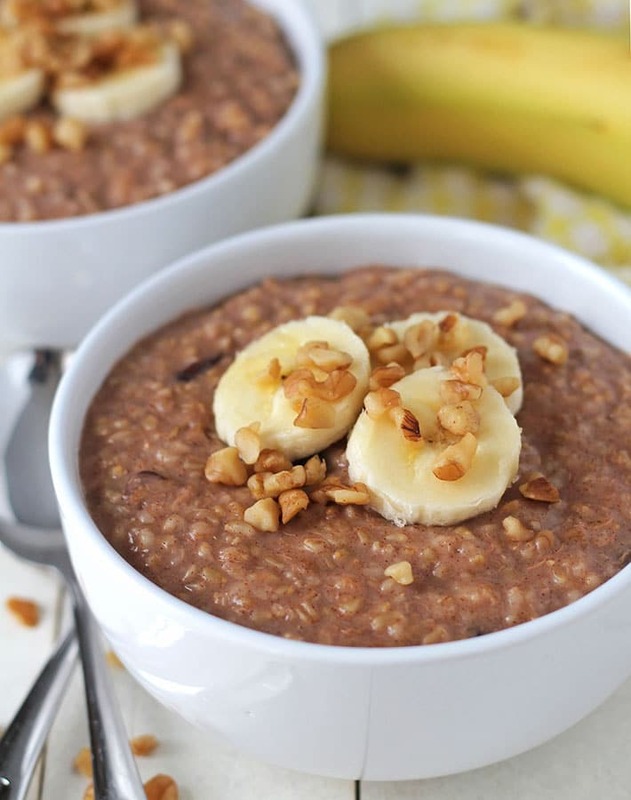 Add steel cut oats, mashed bananas, cinnamon, nutmeg, salt, and water to your Instant Pot. Stir to combine all the ingredients. Once the pressure has been released naturally (you will know pressure has been released when the float valve has dropped back down), slowly unlock and remove the lid. Stir the mixture so everything recombines. Add the raisins and nuts, stir. Add sweetener, to taste. Sprinkle chopped nuts on top for garnish, if using. In the last few minutes of cooking, add mashed bananas, cinnamon, and nutmeg. Stir well to combine. I find that the bananas and the raisins add enough sweetness to the recipe, and I don't add sweetener, but if you prefer it sweeter, taste the oats after everything has been stirred in and add as much or as little sweetener as you like. This recipe makes 4.5 cups of banana steel cut oats, and can be split into two large servings, 3 medium servings, or 4 small servings. I making in the Instant Pot, for safety reasons, I do not recommend doubling this recipe. Make separate batches, if needed. 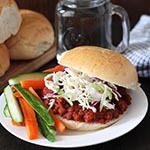 This recipe can be pre-made, cooled off and then refrigerated. When ready to serve, warm up and add a splash of milk or water to loosen it up. Nutrition info is for 1 serving (of 4) prepared as the recipe is written and with no garnishes or added milk. Data below is only to be used as a rough guide. Click to learn how nutrition info is determined on this website.